At the very least, we’re looking at General Motors validating carbon-ceramic brakes for the Chevrolet Camaro ZL1 1LE. 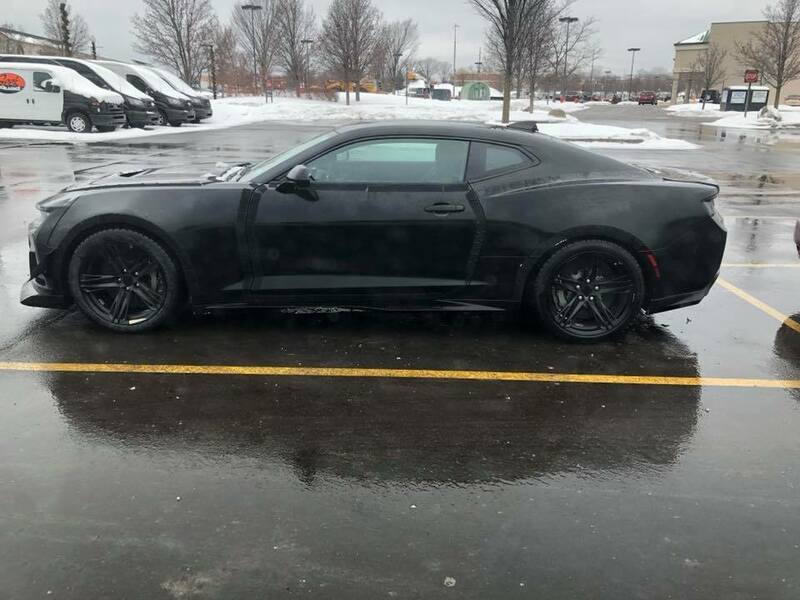 At most, this could be some sort of Camaro Z/28 test mule. Photos of the prototype car, posted to Facebook page V.I.S.I.T. 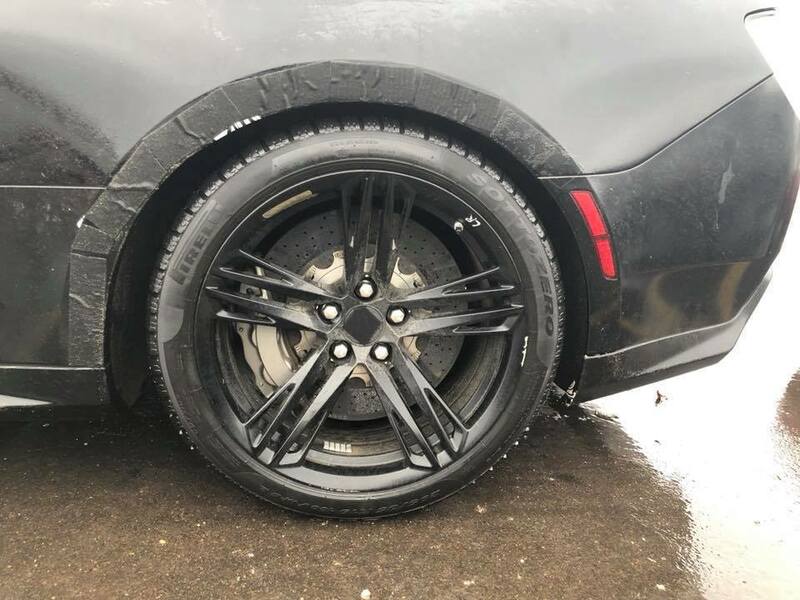 on Monday, show a manufacturer-plated Camaro ZL1 1LE without the massive rear wing, but with large carbon-ceramic brakes hiding behind the wheels. The ZL1 1LE does not feature carbon brakes and retains iron rotors for a variety of reasons. Elsewhere, black masking tape covers portions of the door seams, trunk and hood, which makes this prototype Camaro’s story all about what (hopefully) can’t be seen. The only tip-off that this is something new and different are those brake rotors. If this is some kind of sixth-generation Camaro Z/28 prototype, it begs the question of what resides under the hood. The previous-generation Camaro Z/28 skipped forced induction for the massive 7.0-liter LS7 V8 engine. News on the sixth-generation Z/28 has been near zilch, but a March 2017 report claimed GM is working on a 5.5-liter LT6 V8 engine for such a car. This engine is reportedly a DOHC design with a flat-plane crankshaft and will be closely related to a forthcoming LT7 V8 engine, which could find a home in the ever-unconfirmed mid-engine C8 Corvette. Flash forward to present day, and those rumors seem slightly corroborated. CAD drawings revealed a twin-turbo LT7 V8 engine last month, and a report from last November named three engine options for the upcoming C8 Corvette. One of those engines? A 5.5-liter DOHC V8. Also off the shelf is the 6.2L LT5 V8 powering the ferocious 2019 Corvette ZR1. The dual-injected pushrod V8 boasts a larger supercharger than the LT4 engine found in the Camaro ZL1 and Corvette Z06, and produces a staggering 755 horsepower. It might not be naturally aspirated, as has been Z/28 tradition, but such an engine finding its way to the Camaro family would surely be the crown jewel of a top-of-the-line model. All of this is to say we may just be looking at an upcoming carbon ceramic brake package for a supposed 2019 Camaro ZL1 1LE, and not a Z/28, in this instance. But, Chevy has surprised us before. Interior shots would’ve been nice. I think that stripping the interior and removing sound deadening could remove as much as 150lbs, 190 if they use C7 Competition seats. Carbon ceramics operate at higher temperatures, but they also reduce unsprung mass. If they use Pirelli Trofeo R tires again, that’s another 3-5 seconds less around the Nurburgring and half a second or more around a typical track. Using the LT5 would be great as it improves the LT4 by 100hp without adding much weight, but using a N/A DOHC motor would significantly reduce the weight over the front tires. That’s arguably just as important as adding horsepower on a normal track. Either way, the Z/28 is going to cream 99% of the performance car market around any paved circuit, at quarter of the cost of the best. Isn’t the rear wing a necessity for rear wheel downforce.. as this is why the new C7 Corvette ZR1 has a large rear wing which is to generate rear wheel downforce and keep the rear tires planted on the ground. Yeah. It helps with acceleration exiting turns and provides overall stability at high speeds. Z28… GM did say they will use the 7.0L one more time. I believe that we will see an updated LS7. Maybe an LT7? Please lord! LT7 is a DOHC Twin Turbo V8 according to one of the leaked CAD images. It should be a 5.5L. Other documents also point to GM also making a Naturally aspirated version of the 5.5L DOHC V8, and that would be the logical choice if the Z/28 is Naturally aspirated. See I don’t think that will happen. Maybe LT6. IDK. but I do believe we will see the LS7 one more time. I see this potentially being an answer to the upcoming GT500. It is rumored to be huge on power and pictures of the massive rotors, scream “track-monster” as well. Whatever Ford throws out there, GM can counter-punch with this vehicle. Perhaps an LT5 powered ZL1 1LE/R (for example). If GM uses the Z/28 moniker in anything that isn’t NA, it will be blasphemy, IMHO. The Z/28 has always been NA and should continue that legacy! Oh great, another road course “track master”. Don’t get me wrong, I’m sure it will be awesome but do we really need two high end Camaros like this? Why not one more focused for the drag strip like the Hellcat ? Isn’t the COPO supos to be drag strip focused camaro? A hot 5.5L DOHC V8 would be more of the formula for a Z/28 car. The Z/28 was never a Forced induction or big block car until Camaro Gen-5 came around with that beastly 427ci V8. honestly the ZL1 should always reign as the top Camaro while the Z/28 should be just above the SS-1LE. with a cross plane crank and a 7200rpm redline, the camaro should have about 530hp, the new 10-speed auto with an optional 6-speed manual, a ZL1 rear w/ the E-LSD setup and a suspension that is calibrated comfortably between the 1LE and the ZL1, navigation, premium stereo, houndstooth recaro seats, alcantara steering wheel, shift boot and shift knob, HUD, under body shields, an aggressive front splitter, a larger rear lip spoiler with gurney wing (similar to the 2010-2014 GT500 Shelby), side rocker splitters, Tri-Y mid-length exhaust manifolds, high flow active valve titanium exhaust system and a Z/28 specific hood. Just stick a Katech 700 hp, 650 Ft Lb STREET ATTACK 427 LT1 in a light weight Camaro call it a Z/28 and call it a day. Throw in the Mercury DOHC 7 liter. I think GM should bring back the Iroc Z too with 850Hp and 850Tq , and just make about maybe 20,000 of them and see how fast people will putting there order in for this monster ride. Commuting in Phoenix this morning I saw a camouflaged Camaro. It went up the freeway onramp and sounded exotic, absolutely uncorked and glorious. Couldn’t be anything but the new Z/28, with an exhaust that free and smooth.